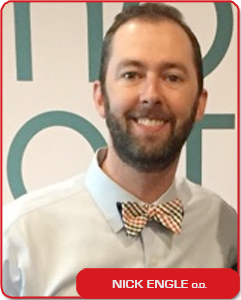 Dr. Nick Engle hails from Sioux City, Iowa and now calls Brentwood, Tennessee home. He practices at Primary Eyecare Group, a multi office practice, that has been serving the Nashville area since 1975. He chose optometry because of his love of helping and interacting with people and graduated from the Southern College of Optometry in 2007. He is an active member and Trustee of the Tennessee Association of Optometric Physicians and was honored with Young Optometrist of the Year in 2011. Dr. Engle also participates in the Special Olympics Opening Eyes Program that provides free screenings, glasses and sunglasses to the participants. He is a member of Maximum Vision Performance which uses cutting edge technology such as the Senaptec Sensory Station to help athletes achieve their best possible vision and gain the advantage to rise above the rest. He understands that any improvement an athlete can make gives them an edge over their competitors and wants to help his patients achieve that improvement. Being one of three brothers growing up he knew nothing but competition and used that edge while being a multi sports athlete in high school playing football, basketball and soccer. Saturdays in the fall you can hear him cheering on his beloved Hawkeyes with his two daughters Piper and Hadley and his wife Dr. Erin Engle. He loves anything that gets him outside including hiking, kayaking, or just plain running after his kids.